You've probably heard about the latest skincare brand to take the beauty world by storm, Summer Fridays. Summer Fridays. currently has one product in the line up,Summer Fridays Jet Lag Mask but it's a winner. 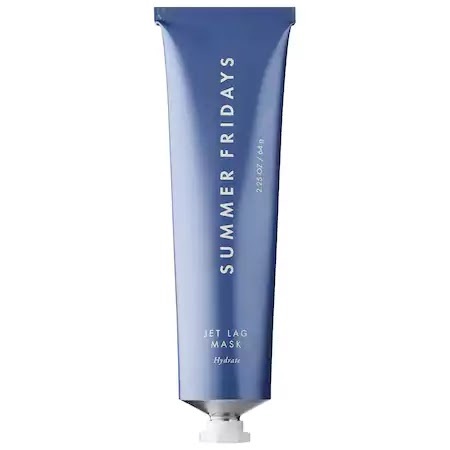 Summer Fridays Jet Lag Mask is a hydrating mask which is free off harmful ingredients like petrolatum, GMOs and surfactants, and is vegan. What is does contain are ceramides, vitamins, antioxidants, and anti-inflammatory ingredients that help to combat puffy, inflamed, tired skin. The formula is heavenly! Summer Fridays Jet Lag Mask applied like a silky, lightweight cream and then seemed to melt into my skin and it turned velvety smooth and completely transparent on my skin. It wasn't sticky, dripping and it didn't dry into a hard, cracked layer. I loved the scent, which was a minty fresh one with notes of citrus/orange. Since it's an invisible mask, I love this for pampering while on long haul flights, (and as an overnight beauty treatment that the hubby will never notice!). On the days I used it as a traditional mask, leaving it on 15-20 minutes (it tingles slightly from the peppermint oil, but it's very subtle), I dabbed off any excess (very little remained). My skin looked incredible. It was plump, hydrated and smooth. This provided a perfect layer for makeup when I used it in the morning, and on the weekends, since my skin looked so glowy, I simply layered sunscreen and some lip color/mascara and I was ready for the day.